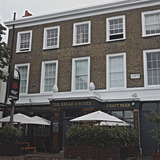 The Bread and Roses is a vibrant pub on Clapham Manor Street that serves a variety of drinks including ethical micro-brewery beers. 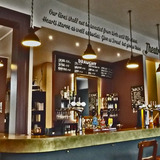 Owned by The Battersea and Wandsworth Trade Union Council (BWTUC) and run by the Workers Beer Company, Bread and Roses prides itself as a pub with a social consciousness. 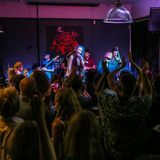 The Bread and Roses offer a diverse programme of live events throughout the week including theatre productions, comedy nights and live music. The venue also serves street food by Chop and Chip. "Nestled in the back-streets of Clapham lies this Grade 2 Listed gem. A hub of creativity, fostering an eclectic mix of live music from young and old, a bustling programme of theatre productions, and the highly regarded Clapham Comedy Club –graced by such names as Micky Flanagan, Stephen Merchant and Sarah Pascoe. All topped off with great beers, great food and the best beer garden in Clapham." We have a full program of live music every Friday and Saturday night. Some of the best live bands/musicians around. Ranging from reggae, blues, indie, folk and more. What did you think of The Bread and Roses? The Bread and Roses does a very good meal. The atmospehere is very friendly and the staff are all nice and capable of using their own intitative, which you don't often get in restaurants in this area. I will return to The Bread and Roses and shall certianly be telling my friends about it. As a local I try to be supportive of the BnR and it is usually good for a beer in the evening.Just had a really disappointing Sunday lunch experience though....only about four customers in the place when we arrived but staff too busy for welcome or eye contact. Took an age to get served drinks and then half the menu was unavailable. When it did arrive after 40 minutes it was cold and low standard. Staff were disinterested when I politely expressed disappointment - taking the line that they were busy (!) and not responsible for the food as it is bought in. An apology, free drink, offer to get the manager might each have made me think they were trying but none of these occurred to them. Will be a while before I bother again. Located slightly off the beaten track, away from the throngs of Clapham High Street, Bread and Roses is a real find. Bread and Roses is located on a quiet residential road and is certainly an attractive proposition, resplendent as it is with a large front patio complete with outdoor seating, pretty foliage, overhead canopies and heaters. Inside, there’s an almost student union feel to the place with a corner bar covered in funky posters and simple tables and chairs. There’s a small, kitsch stage area for bands and a garden. Fairy lights and in-your-face artwork all add to the appeal and it looks like everything just fell into place rather than a direct attempt to produce something ‘cool’. That said, there is a function room with its own bar upstairs that can be dressed up to appear more formal. 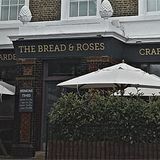 Bread and Roses has a real community feel to it, mainly due to the fact that it’s run by Battersea and Wandsworth Trades Union council, a body made up of a group of volunteers who support local and international workers rights campaigns. They’re also involved with the Workers Beer Company, which raises funds for trade unions and campaigning organisations. Still, you wouldn’t know that if you were just popping in for a pint. The atmosphere is laid back and the staff are friendly and welcoming to all, even though they have a large contingent of local regulars. They also offer a steady stream of events from barbecues, quiz nights and flamenco to DJs, bands and live sports on the big screens. It all adds to the pub’s appeal and charm. Bread and Roses works with local restaurant El Rincon Latino to offer a small choice of tapas dishes, priced from £2.50 to £5.75. It’s a clever way of raising the standards on the typical pub fare as El Rincon Latino is a respected local eatery. Bread and Roses excels with its selection of beer, offering Stiegl, Budvar, Erdinger, Becks Vier, Maredsous, Guinness and Doom Bar, well priced from £2.95-£3.60 a pint. This is bolstered by an equally strong bottled beer selection. If beer isn’t your thing there are a handful of classic cocktails priced at £5.50-£6 with choices like a White Russian or Tequila Sunrise. There’s also a good range of wine, with white, red, sparkling and rose bottles all on offer for £13-£27 a bottle, and the vast majority coming in at well under £20. Bread and Roses delivers across the board and does so with a kitsch style that’s all it’s own. A great place to call your local. I went with some friends on a Sunday for a 'recovery' roast. The food was fantastic - best veges I've had in ages. Only reason I'm not giving them the full 5 stars is because there were loads of kids running around, which frankly, was annoying. A fantastic antidote to all the heaving chain-pubs on Clapham High Street: great music, great beer (loads of real ale, proper lager and weird stuff in bottles) and very reasonable food. Run by the Workers' Beer Company, it offers a tantalising glimpse of a glorious socialist Britain!